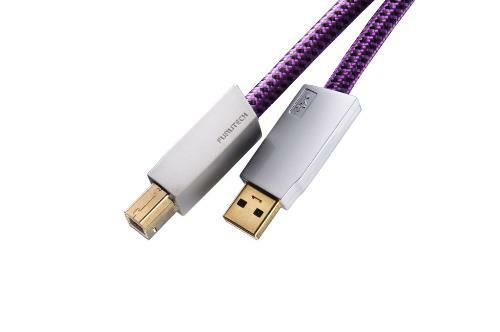 Following on from the success of the Furutech GT2 USB cable Furutech now introduces the higher specified GT2Pro 2.0 USB cable. The cable is formed around special α (Alpha) OCC silver copper alloy conductors with superior high-density polyethylene insulation/dielectric. As illustrated below the GT2Pro features three-layer shielding and specially engineered 24k gold-plated USB 2.0 connectors with a special 24k gold-plated copper alloy EMI shield incorporated into the connector. The cable wrap includes damping and insulating materials keeping mechanical ringing from affecting the sound. A carefully engineered clamp improves grip and keeps both mechanical and electrical distortion at bay. The result: Clear and open highs, elegant midrange textures, powerful but in-control bass, and an enhanced sense of the sheer palpability of the music you’ll enjoy. The GT2Pro series creates real musical experience from the data stored on your computer.